Don’t miss your opportunity to check out over 40 San Diego museums at a discounted price! The best part? Many of these museums are located just a few minutes from our boutique hotel in Little Italy, San Diego. 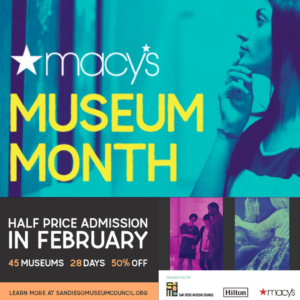 Macy’s Museum Month is back for its 29th year this February. San Diegans and tourists are invited to enjoy half-off admission at more than 40 San Diego Museum Council (SDMC) member museums the entire month. Whether you are an art aficionado, history buff, or nature lover, the SDMC has a variety of member organizations that are bound to capture your interest. And with these special savings that are only offered once a year, it’s a great time to visit both old favorites and new attractions you have never even heard of. Aspiring museum-goers can pick up a Free Museum Month pass at any Macy’s in San Diego, Temecula or Imperial Valley –find a store near you– beginning February 1, 2018. Each pass admits up to four people at half price. Each pass also features an exclusive coupon for up to 20% savings at Macy’s. Promotion ends February 28, 2018. Additional fees may apply for special exhibitions and events at participating museums. For a full list of participating museums and more details, visit: https://www.sandiegomuseumcouncil.org/museum-month. We invite you to make a vacation or staycation out of this opportunity, and stay with us in the heart of Little Italy, San Diego. © 2019 La Pensione Hotel. All Rights Reserved.